That was a pleasant conversation. Bobby Kotick, CEO of Activision, doesn’t really have a positive reputation among people, and for a reason. Once he said that people who wanted new IPs were a vocal minority and want new things every year, but in reality they are people are happy with existing franchises, provided innovation happens within them. Once he bluntly told the gaming press that he would considering dropping PS3 support if Sony doesn’t drop the PS3 price. Say what you want, he is a man that knows how to conduct business. After all, he has guided a series into astronomical success without making people fatigued. Yes, you probably don’t play Call of Duty any more but when it is not reflected in Activision’s financial statements, well, Kotick doesn’t care. In a fantastic interview with the New York Times, he revealed how people were photoshoping horns onto his face signifying that he is some sort of a devil. Yes, he knows, and apparently searches about himself in Google. Not a bad thing though, all that fame… yumm. “Think about what it’s like for my dating life when the first picture that comes up is me as the Devil,” he told The New York Times. This kind of shows that he is also someone who has a good sense of humour considering he is actually ready to talk about all these things and brush it off with a smile on his face. He also recently revealed that he felt no remorse in firing former Infinity Ward employees who were embroiled in the Modern Warfare 2 fiasco because they tried to take 40 employees from him and tried to break the contract. “You find out two executives are planning to break their contracts, keep the money you gave them and steal 40 employees. What do you do? You fire them,” he said. That must have been fun, you know, firing people and all. 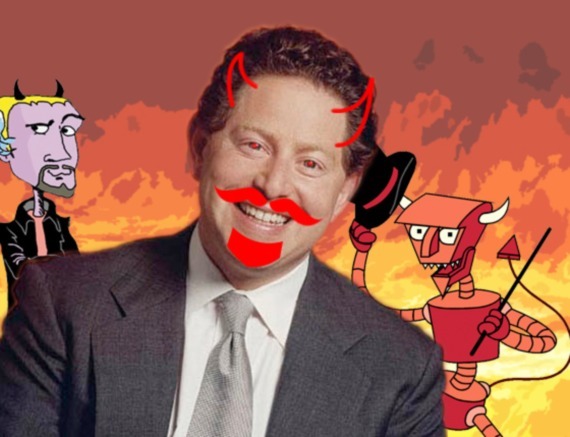 Do you like Kotick or absolutely loathe him? Let us know below.